Walther Beyer sculpturing Lotte Laserstein "Der Bildhauer – Walther Beyer, modellierend"
Signed Lotte Laserstein and dated 1946. Panel 102 x 80 cm. A special thank you to Dr. Anna-Carola Krausse for additional information regarding this lot. The list of exhibitions has been changed after the catalogue went to print. According to information given aquired from a collector in London in 1988. Thence in a Swedish private collection. Exhibited with the title "Skulptören"
Probably exhibited Agnews Gallery, London - off catalogue, 1987. Anna-Carola Krausse, "Lotte Laserstein, Leben und Werk", 2006. Mentioned p. 239 ff. "Following her exhibition at Galerie Moderne in 1937 Lotte Laserstein was offered several commissions. The models of those early years included cultural celebrities, members of the nobility and the bourgois upper crust, not least the king’s chamberlain Graf Erik Trolle and his family, the composer Hilding Rosenberg, the business man Ruben Rausing or the publisher Torgny Segerstedt. In other words: the painter experienced a very good start in Sweden and managed to make a living as a demanded portrait painter. However the "painting to order" as Laserstein would put it later in a letter to her close friend Traute Rose, turned out to be an exhausting challenge. As a commission painter Lotte was forced to consider the wishes and expectations of the sitters. 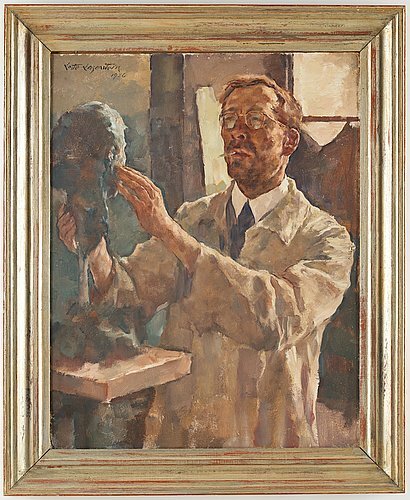 The portrait of Walther Beyer (1902–1960) however is one of the very rare paintings of this period which Laserstein made just "for herself". In the mutual sittings with Beyer in the mid-forties she could work without any pressure, which she appreciated a lot. Indeed we can perceive a certain freshness in this painting. 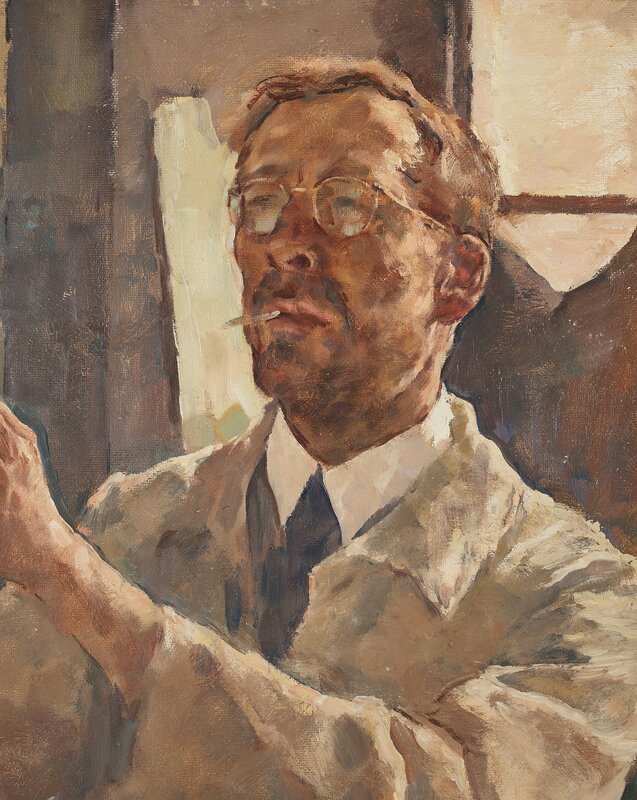 Laserstein performs a vivid brush stroke; the masterly alla prima painting is a skillful interplay of pastuoso parts and delicate thin layers of paint: The light reflexion in Beyer’s glasses are just four splashes of the brush, the cigarette is a simple stroke. Beyond catching the likeness of Beyer tremenduously well and giving us an idea of his personality – a bit bohemian, a bit bourgeois (as indicated by the bright white collar) – Laserstein arranges the portrait as a concentrated and intimate working situation, a silent dialogue between the artist and his creation. The painting was first exhibited in Sundsvall in the very year it was executed. Obviously Laserstein herself thought very highly of it: it was the most expensive painting in the whole show, even more expensive than some works of the Berlin time. The sculpture finally was given to Lotte Laserstein as a present. It still exists in a private collection in Sweden today." Lotte Meta Ida Laserstein was born in the province of East Prussia and was of Jewish background. Her father died when she was 5 years old and she grew up with her mother and grandmother in Gdansk and in Berlin. Laserstein entered the Berlin Academy as one of the first generation of female painters. Here, Laserstein studied for Erich Wolfsfeld, who was to become her mentor and lifelong friend. In her final two years at the academy she was his 'Atelier Meisterschal' or 'star pupil'. This entitled her to her own studio as well as free access to materials and models. It was the “roaring 20s” and she was very successful with her portrayals of especially the young modern urban women of Weimar Republic. Laserstein frequently took part in group exhibitions as well as solo exhibitions. Her production, however, was narrow and exquisite. With the influence of Nazism in the early 1930s the political climate hardened and it became increasingly difficult for her to show her work. 1934 is the last year that she is permitted to participate in a public exhibition in Germany and her promising career came to a halt. An opportunity opens up in 1937 and Lotter Laserstein travels to Sweden, bringing the bulk of her production with her. She exhibits at Galerie Modern in Stockholm, and decides to try to stay in Sweden permanently. 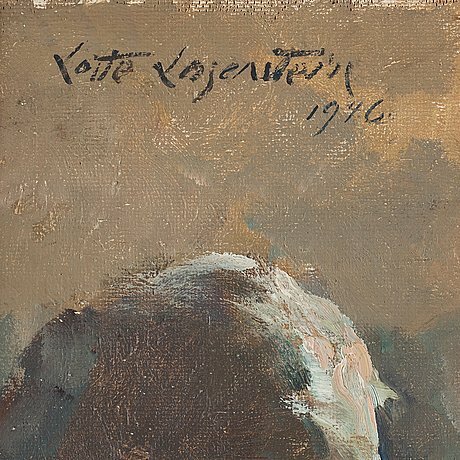 Times are challenging, visas are granted only three months at the time, the possibility to return Germany is dangerous, but Laserstein decides to prevail and makes living painting portraits on commission. She meets the sculptor Walther Beyer, a fellow German who has sought refuge in Sweden. In Beyer she finds a soul mate, he is suffering hard from loss of belonging, uncertainty regarding the future and artistic isolation. They work together in the evenings and Laserstein portrays Beyer on three known occasions over the years. 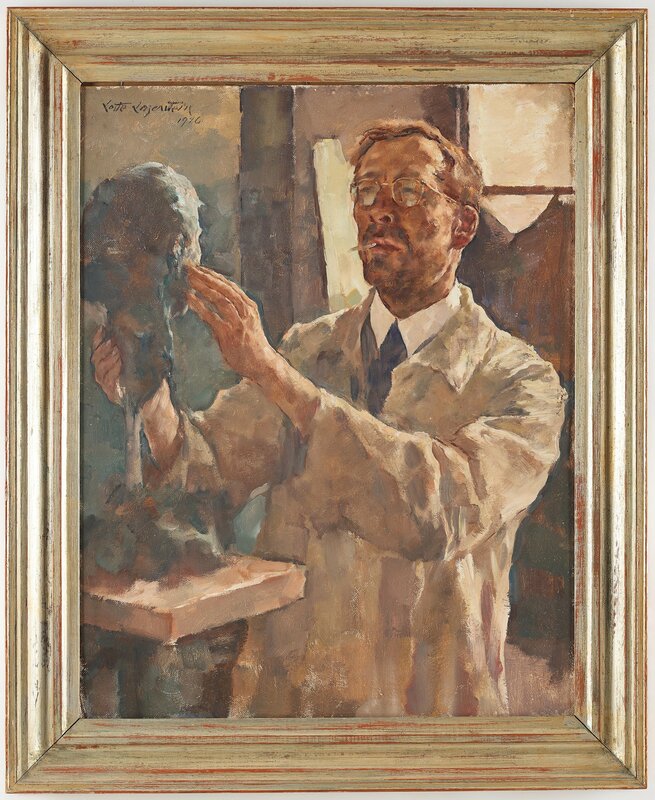 In the painting for sale at the auction we see Walther Beyer sculpturing a bust of Lotte Laserstein. She mentions Beyer and the specific portrait in letters to her friend and favorite model in Germany, Traute Rose. ”My commissioned work is more elaborate, but tame, this portrait is my absolute favorite”. Dr. Anna-Carola Krausse, who has written her doctoral dissertation on Laserstein and later the book “Lotte Laserstein , Leben und Werk” (2006) mentions the portrait in her book and it is included in her catalogue raisonné. By 1987 Lotte Laserstein was 89 years old and more or less forgotten in the art world. She lived a quiet life in Kalmar on the Swedish East coast. One day she received a visit from a representative of Agnews Gallery in London. 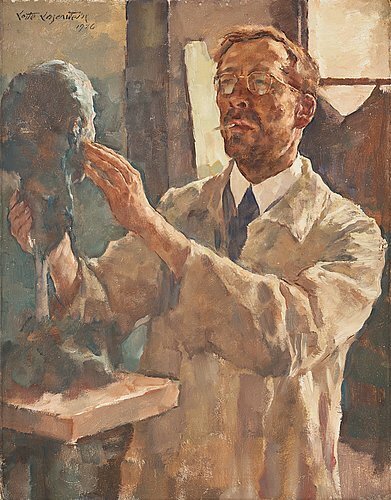 The gallery had decided to commemorate the work the artist Erich Wolfsfeld and they wanted to interview his former student and friend Lotte Laserstein. A representative from the gallery visited Laserstein in her home in Kalmar. It was decided there and then to bring the collection of Lotte Lasersteins early works to London for an exhibition sale. The double exhibitions at Agnews and Belgrave Gallery in London were an immediate success, almost everything was sold. This was the beginning of a remarkable international rediscovery of Laserstein as an artist. In 2003 Museum Ephraim-Palais i Berlin opened the exhibition "Meine einzige Wirklichkeit", with a catalogue by Dr. Anna-Carola Krausse, followed by several exhibitions in Sweden, in Kalmar, in Stockholm and in Uppsala. Den tysk-svensk-judiska konstnären Lotte Meta Ida Laserstein, föddes i Ostpreussen och dog i Kalmar 1993. Laserstein avslutade sin utbildning i Berlin 1927 och fick snart stora framgångar. I och med nazisternas maktövertagande 1933 avbröts dock hennes lovande karriär, varpå hon flyttade till Sverige. Huvudsakligen kom hon här att etablera sig som porträttmålare, utöver personporträtt ägnade hon sig också åt landskapsmåleri.